This summer I am participating in Melissa at Happy Quilting's Summer Solstice QAL! This is the first time doing one of her quilt alongs after following them for what has to be years! I won these fabrics over three years ago, so it was probably time to put them to good use. They are from the Botanica line from Timeless Treasures. The fuchsia marble is my background, I am going to use the green marble for my inner stars (the yellow in the diagram), the large black floral will the be "surround" (red in the diagram) and the white will be my outer stars (orange in the diagram). I'm planning to use the smaller floral for my binding and potentially some of my sashing. I got everything all cut this weekend and ready for the next set of directions! Linking up with Happy Quilting to share my slicing! My mom was here this weekend visiting and while she was here, I went through my pile of abandoned quilt blocks and sorted out a few for her to donate to a guild that makes charity quilts. I also pulled out a few blocks for myself to work on and try to finish. 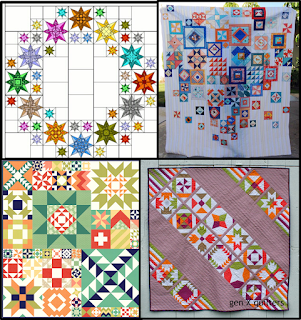 One of these abandoned projects was started from the triangle cut offs from a Stash Bee block that I made in 2013. Yes, 2013. The blocks are here, the start of the pinwheels are here, and I guess that's the last time I posted about this project. I actually took my pinwheels and put them together with some solid aqua Kona and made a table runner top and then the project was put in the abandoned project box for almost three years. Since it was a little on the small side for a table runner, I added some red borders. I found some patriotic fabric in my stash to use as the backing, quilted it, and bound it with some red striped fabric. This was such a quick and easy afternoon finish! I quilted it with loops and stars to give it more of a patriotic flair. The backing fabric is VERY busy but on its own as a "wholecloth" style table runner, I think it works well. I have used this fabric in things before, but usually in rather small pieces. It's good to have a finish and something new to put on the table! Sharing at Finish it up Friday, Free Motion Mavericks, Fabric Tuesday, and Sew Cute Tuesday! 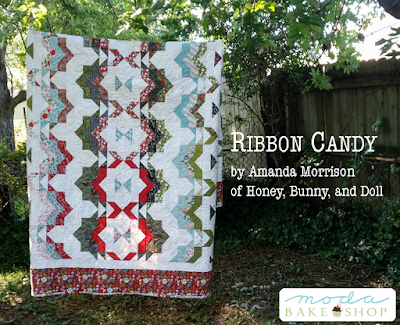 Now on Moda Bake Shop: Ribbon Candy! While I didn't "help" with this quilt, I am excited to share that my sister Amanda has another pattern on Moda Bake Shop today! 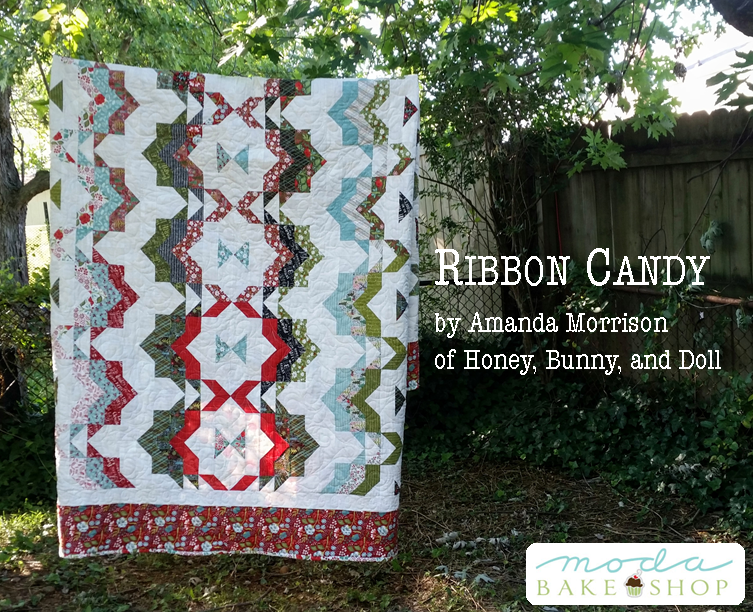 Introducing Ribbon Candy! 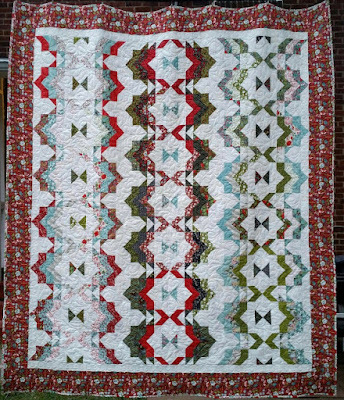 This quilt uses two jelly rolls and some yardage for the background, border, and backing. She used Basic Grey's new Christmas line Juniper Berry which is SO adorable! 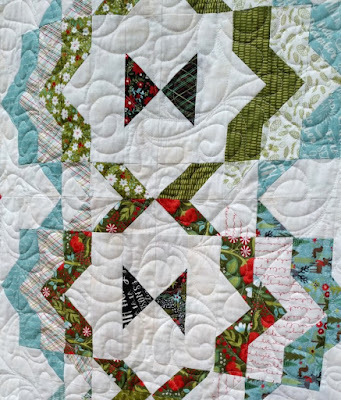 While the piecing is not complicated in this quilt -- it is mainly stitch and flip squares and rectangles -- the main thing is keeping all of your colors arranged to have your ribbons in the right order. Here's a close up of the block! Hop on over to Moda Bake Shop to check it out! Today I only have one block to share, but it's a good one! I made one of my two blue birthstone blocks this week -- my March Aquamarine. There are a few patches that are a little on the dark side, but I am extremely happy with it in the grand scheme of things. This week I hope to get my true blue sapphire done so that I'll have eight of my twelve birthstone blocks done! You can get this pattern from No Hats in the House. Sharing at Scrap Happy Saturday! This post is about jerks. While we have been thoroughly reminded that the world is full of mean jerks lately, unfortunately there are also jerks lurking in our quilting community. About a month ago, when I was Pinterest-ing before bed, I clicked on a post bearing resemblance to a pattern that I both own and have made and got sent over to a blog I had never been to before. I was taken aback because this person was purporting this to be their original design and had made their version (identical to the original) of the pattern available for free on their site. Knowing that it was far to late to try to fight copyright infringement and plagiarism at 11 PM in my pajamas, I liked the post on Pinterest as a mental note to follow up on it. Of course I forgot about it until Friday last week. 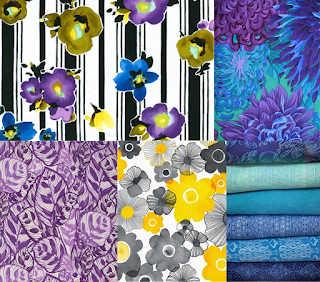 When I finally got back to investigating, I looked through the entire blog and realized that many of the free patterns posted by this person were outright copies of patterns by designers that I recognized. Just based on patterns that I recognized I found five instances of plagiarism in this person's blog -- four of which took for-purchase patterns and made their own free versions of the pattern. I emailed each pattern designer with the link to the blog post of the copied version of their pattern and all of the posts containing the copied patterns have since been taken down and removed from the blogger's website. One designer told me this person was rude and wouldn't apologize and one designer's business manager told me that they recognized additional patterns taken from another designer and passed on the website to them. Side note: these aren't little pattern designers like myself either, we're talking people I would consider "big time" designers and bloggers who have fabric lines, books, you name it. I'm hugely surprised people didn't notice that the blogger in question was copying patterns before now because some of the posts in question were over a year old. This could be a function of this person being a relatively new blogger with a relatively small following but it's probably also related to the fact that people are jerks and like getting things for free. This person, who has made a name for themselves by copying others, is going to be featured in not one, not two, BUT SEVEN upcoming quilt magazine issues. Needless to say, this grinds my gears. I've put in complaints via the customer service emails for each of the magazines or publishers that this blogger has said will be publishing their patterns. But really, what else can be done? This person has gotten their "in" as a pattern designer with major magazines and they will likely not suffer any consequences. Magazines work months ahead of schedule and likely some of these issues are already printed. 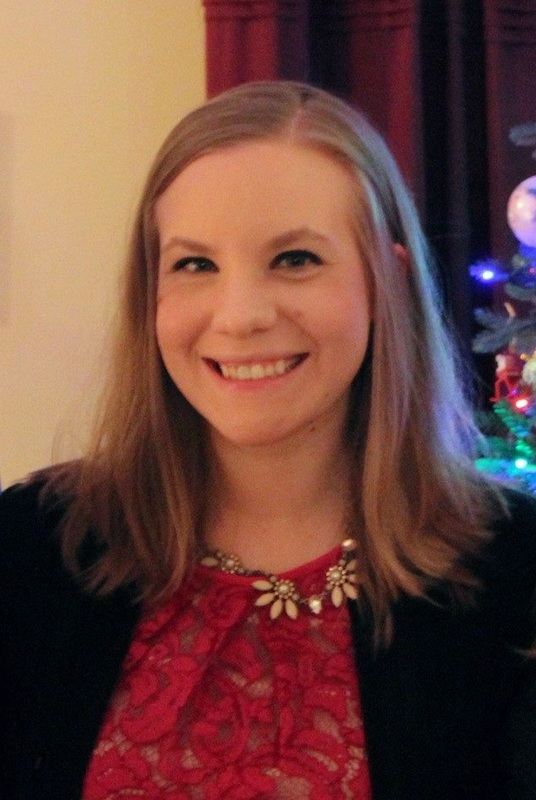 This post is more of a vent than anything else since I don't feel like it is appropriate to start a witch hunt by sharing this person's name and blog because they have actually removed all of the posts as requested by the designers even if they have been plagiarizing with reckless abandon. So I leave you with this thought: the quilting community is amazing 99% of the time. This 1% of jerks can't be allowed to succeed -- this is why things like May is for Makers is so important. If you see something that just isn't right, don't be afraid to say something. Update 6-16-16 9 AM: I actually received a response from an editor at one of the magazines in question that they will be cutting ties with this person and will be removed from consideration from any future issues. Unfortunately with the way that the magazine process works, they may or may not be able to pull some of the patterns out of the fall issues, which is disappointing. When I saw that sign ups were open for the Traveling Quilt Bee on Instagram, I was very intrigued and signed up. 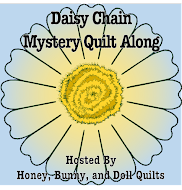 I have seen a number of other quilters participate in these sorts of bees, but this one caught my eye because the quilt isn't necessarily going to be a medallion quilt -- the next quilters in the chain won't add to all four sides, just one or two! The floral print in the upper lefthand corner is a large scale fabric that I bought eight yards of about a year ago at one of the local quilt shops with the intent to use it as a backing. This seemed like the perfect opportunity to use it so I built my color palette around it, minus the olive green. 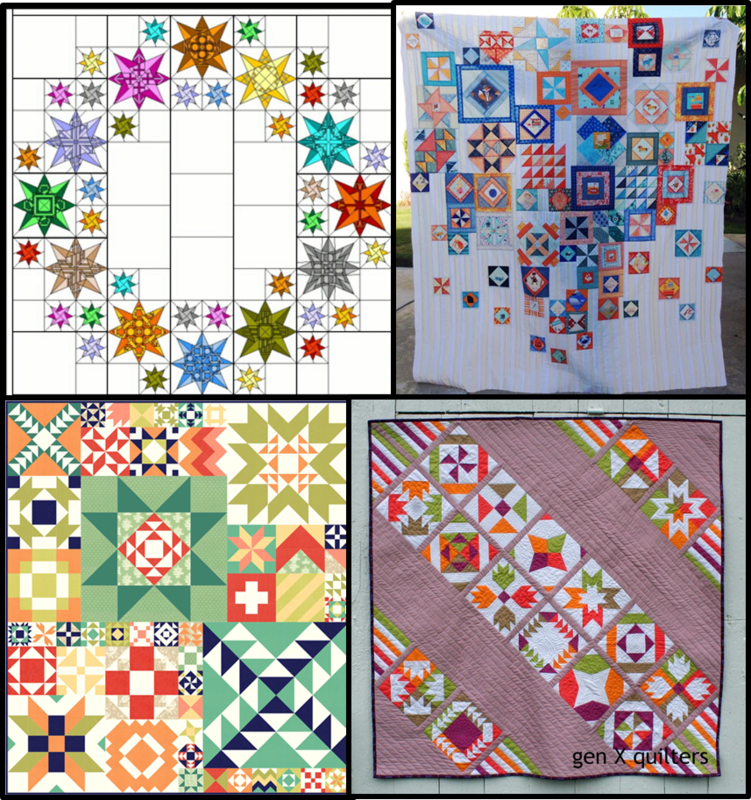 The Moda Building blocks quilt in the bottom left is probably closest to my "vision" and will likely be the easiest to achieve in this style of bee. The main focus is classic blocks in various sizes without any sashing or borders. This weekend I made my starting block! 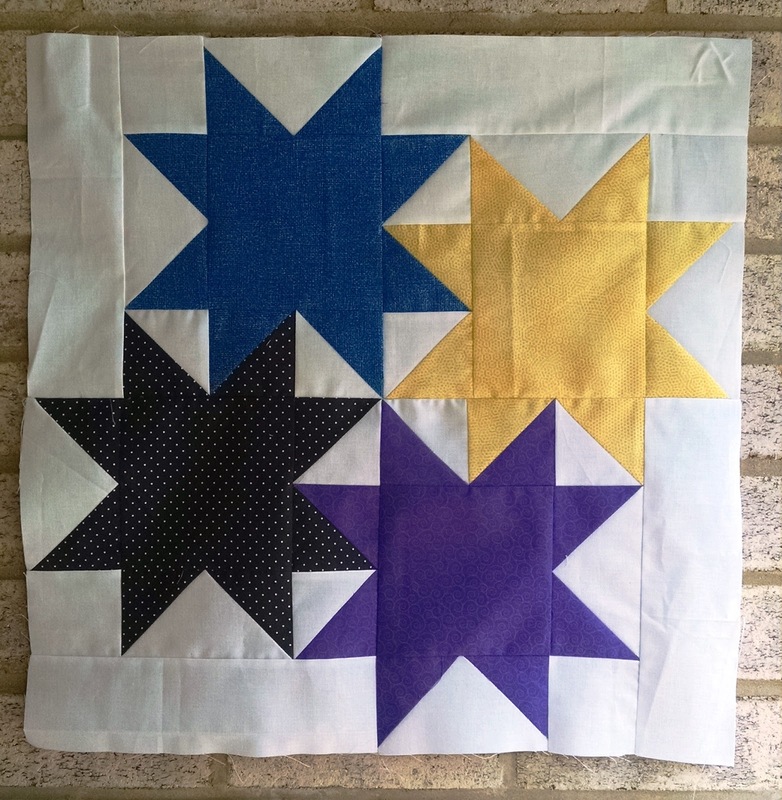 I used Judy Martin's Star Cluster block, but adjusted it to make a 20" finished block. I used all small scale prints and tonals as my focus fabrics and Kona white as my background. We also are including a journal with our quilts as it travels along so that our bee mates can add notes about what they did! I wrote in a lot of details about what I am looking for, as well as included the size of my block and where it came from, then recommended some block sizes for going forward. This should be a fun adventure for the rest of the year! 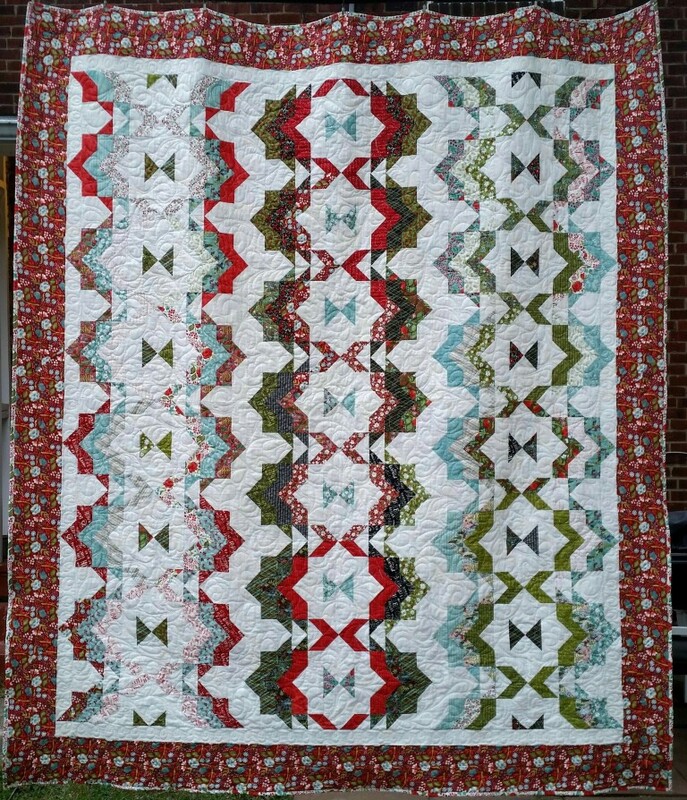 I am very excited to get my first quilt to work on at the end of this month! Sharing at Fabric Tuesday, Let's Bee Social, and Sew Cute Tuesday! This week I finished up my last five Farmer's Wife blocks for this month. I definitely didn't use quite as much lime green as I originally planned, but I am very happy with these blocks! These will blend very well between my blue blocks and my green blocks! Since I'm done with all of my Farmer's Wife blocks for this month, I'll be working on my two blue birthstone blocks next week. After that -- who knows! I need to get started on my next Moda Bake Shop quilt for July too! Sharing at Scrap Happy Saturday and Oh Scrap! This month for the Stash Bee, Francis has requested King's Cross Blocks inspired by this pattern. She asked for the main fabric to be floral and for the colors to be bright and cheery! For the first block I found a yellow vine print with birds on it! I used a pink jelly roll strip from my stash as the sashing and a purple centerstone. For the second block I used a psychedelic floral print in oranges and yellows, a green and blue floral print for the sashing, and the same purple centerstone. These will be sent off to Germany this weekend! 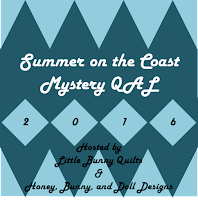 It's the first Tuesday of the month so that means it is time for another installment of the Summer on the Coast QAL! This is our last month for making blocks -- next month will be the top reveal with lots of tips on how to put your quilt together! In the mean time, let's get to making our twisting triangle blocks. Update 1/2/19: Right now our free patterns are not available because of the changes to Craftsy. We are in the process of moving our free patterns to Payhip and will send an update once that is complete. Small triangles: Cut 4 inch squares diagonally in half once. You will need to cut 12 squares (24 triangles) for the baby size, 18 squares (36 triangles) for the throw size, and 40 squares (80 triangles) for the twin size. Large triangles: Cut 7.75 inch squares diagonally in have twice, using two different color fabrics. You will need to cut 6 squares in each color (48 triangles total, 24 in each color) for the baby size, 9 squares in each color (72 triangles total, 36 in each color) for the throw size, and 20 triangles in each color (160 triangles total, 80 in each color) for the twin size. NOTE: as requested by one of our participants, you CAN use charm squares in this unit. Instead of cutting 7.75 inch squares diagonally twice for your large squares, cut your charm squares in half diagonally once. This will be slightly tight, but if you are careful about your placement you should be able to use the charm squares. You can also use charm squares for your small triangles. For each block, you will need one large triangle in each color, one small triangle, and one section of strip -- you should be able to get 4 blocks pieced with one of your WOF strips. Start by sewing your two large triangles together. It honestly doesn't matter which color goes where, but you should be consistent through all of your blocks. Now add your strip to your triangles. You will likely want to trim off your excess WOF strip so that it isn't in the way! I trimmed mine at an angle so that it wasted less fabric. Finally add your small triangle and trim your block to 6.5 inches. That was simple, right? If you haven't joined in yet, there is still time! Don't forget to share pictures in the Flickr group! It's the beginning of the month which means there is a new color for the Rainbow Scrap Challenge! Our assigned color this month is aqua with lime green accents. In January, the color was true blue and so I separated my blue scraps into true blue and aqua/teal piles so I was already ready to go for this month. My piles of light, medium, and dark aquas and teals aren't too frightening. I don't have a ton of lights, so I will probably have a few blocks with darker backgrounds. My mediums pile is double the size of the dark pile and triple the size of the light pile, so that's where I'll be focusing my attentions. I was able to get the first six blocks together relatively quickly over the last two days, so potentially I'll be able to squeeze in some of my blue birthstone blocks this month too! As you can see, other than the Night and Day block, these were pretty simple to put together. I think my favorite out of this bunch is the Noon and Light block -- what about you? Can you spot the little koalas on the maple leaf block? Have a wonderful weekend! Sharing at Scrap Happy Saturday! Don't forget that Tuesday is the next installment of the Summer on the Coast QAL! And pop on over to Flickr if you might be interested in doing a 2.5 inch strip swap at some point this summer!